For other uses, see Inn (disambiguation). Inns in Europe were possibly first established when the Romans built their system of Roman roads two millennia ago. Some inns in Europe are several centuries old. In addition to providing for the needs of travelers, inns traditionally acted as community gathering places. Historically, inns in Europe provided not only food and lodging, but also stabling and fodder for the travelers' horses. Famous London examples of inns include the George and the Tabard. There is however no longer a formal distinction between an inn and other kinds of establishment. Many pubs use the name "inn", either because they are long established and may have been formerly coaching inns, or to summon up a particular kind of image. Inns were like bed and breakfasts, with a community dining room which was also used for town meetings or rented for wedding parties. The front, facing the road was ornamental and welcoming for travelers. The back also usually had at least one livery barn for travelers to keep their horses. There were not lobbies as in modern inns; but the innkeeper would answer the door for each visitor and judge the people whom he decided to allow to come in. Many inns were simply large estates that had extra rooms for renting. As modes of transport have evolved, tourist lodging has adapted to serve each generation of traveller. A stagecoach made frequent stops at roadside coaching inns for water, food and horses. A passenger train stops only at designated stations in the city centre, around which were built grand railway hotels. Motorcar traffic on old-style two-lane highways may pause at any camp, cabin court or motel along the way, while freeway traffic is restricted to access from designated off-ramps to side roads which quickly become crowded with hotel chain operators. The lodging aspect of the word inn lives on in hotel brand names like Holiday Inn, and in some laws that refer to lodging operators as innkeepers. The Inns of Court in London were once accommodations for members of the legal profession. In Asia Minor, during the periods of rule by the Seljuq and Ottoman Turks, impressive structures functioning as inns (Turkish: han) were built because it was thought that inns were socially significant. These inns provided accommodation for people and their vehicles or animals and served as a resting place for people, whether travelling on foot or by other means. The term "inn" historically characterized a rural hotel which provided lodging, food and refreshments, and accommodations for travelers' horses. To capitalize on this nostalgic image many typically lower end and middling modern motor hotel operators seek to distance themselves from similar motels by styling themselves "inns", regardless of services and accommodations provided. Examples are Premier Inn, Holiday Inn, Comfort Inn, Days Inn and Knights Inn. 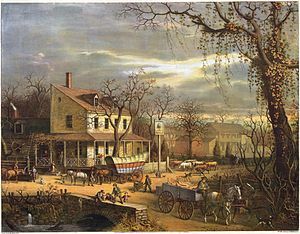 The term inn is also retained in its historic use in many laws governing motels and hotels, often known as "innkeeper's acts", or refer to hôteliers and motel operators as "innkeepers" in the body of the legislation These laws typically define the innkeepers' liability for valuables entrusted to them by clients and determine whether an innkeeper holds any lien against such goods. In some jurisdictions, an offence named as "defrauding an innkeeper" prohibits fraudulently obtaining "food, lodging, or other accommodation at any hotel, inn, boarding house, or eating house"; in this context, the term is often an anachronism as the majority of modern restaurants are free-standing and not attached to coaching inns or tourist lodging. ^ "§ 43-21-13 - Defrauding innkeeper :: 2010 Georgia Code :: US Codes and Statutes :: US Law :: Justia". Law.justia.com. Retrieved 2014-07-13. Wikivoyage has a travel guide for Travel accommodation. The Lost Pubs Project: Lost and closed pubs of the UK.